Taylor Gray entered the inaugural Old North State Nationals with momentum on his side after he dominated the MTP Tire 300 and held off Josh Berry and Tommy Lemons Jr. in the closing laps to pick up his first CARS LMSC Tour victory at Hickory Motor Speedway. The speed that Gray possessed that weekend carried over into Sunday by bringing his #17 Gray Motorsports / Valvoline Toyota home in second place, but he could not help but feel disappointed in that effort after being a contender for the $30,000 paycheck all afternoon. After posting consistent speeds in the Saturday afternoon practice sessions, Gray set a high bar for the rest of the field by obliterating the track record in qualifying with a time of 13.969. Brandon Pierce would be the only other driver to break into the 13-second barrier with a 13.974. Gray would get off to a strong start from the pole by utilizing the high line on the initial start and pulling ahead of Pierce. Gray would stick to his strategy following a couple of restarts and would go on to lead most of the first half of the race despite having Berry right on his back bumper. A competition caution on Lap 77 brought the entire field down pit road, where Gray’s crew elected to take fuel only and make a couple of adjustments to his Late Model. This would end up costing Gray a few laps into the ensuing run, as Berry would get around him using the high line that worked to Gray’s advantage earlier in the day to pull away with the lead. Gray struggled to keep pace for the next 50 laps, as he would lose positions to Pierce, Lee Pulliam, Corey Heim and Trevor Ward. Gray would finally catch a much-needed break on Lap 151 when another competition caution was displayed, which allowed him to come into the pits again for fresh tires. Gray’s run back up to the front would not be easy, as he found himself trapped behind cars that elected to stay out under the caution while simultaneously dealing with an attack from Pierce behind him. Gray eventually cleared the slower traffic and managed to put a comfortable distance between him and Pierce before the last caution of the day came out with 13 laps remaining. 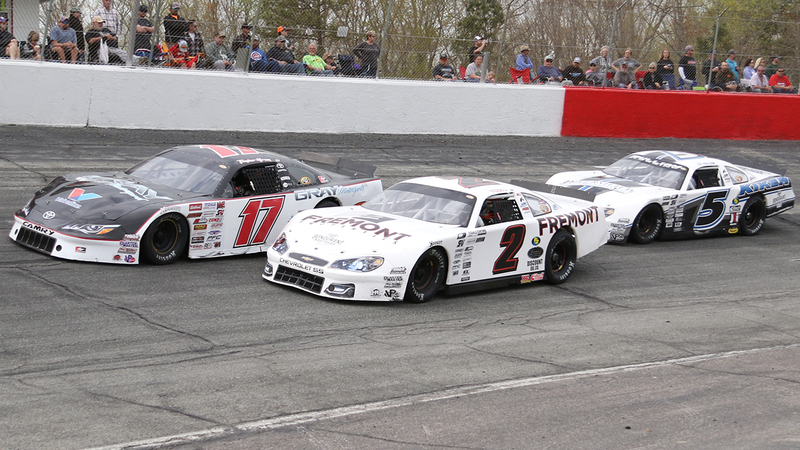 Gray would briefly challenge for the lead in a four-way battle between him, Berry, Pulliam and Pierce, but he would ultimately not have the speed to challenge for the win in the closing laps. Gray offered his congratulations to Pulliam and his team for securing the $30,000 paycheck, but he plans to move on from the weekend and focus on the next CARS LMSC Tour race at Ace Speedway. Gray plans to run all of the races in the 2019 CARS LMSC Tour season, and he currently finds himself in contention for the series championship with a four-point deficit to Berry in the standings. Both drivers will look to continue their strong starts to the season when the green flag for the Race at Ace 125 drops on May 3rd.